Besides our sofa cleaning, we provide the following professional services: curtain cleaning, drapery cleaning, mattress cleaning, bed bug treatment and blinds cleaning. The mattress cleaning service can help reduce the symptoms of runny nose, dust allergies, asthma, itchy red eyes and headaches. Our cleaners don't use moisture to clean your pillows and mattresses from debris and dust. They use intensive ultra-violet light to efficiently remove bacteria, dust mites and fungal spores. We can deep clean any kind of sofa like convertible sofa, hide-a-bed, loveseat, divan, couch, settee, sectional sofa and sofa bed. Our cleaners have the experience and the equipment to clean any type of upholstery and remove a variety of stains, including paint, tea, oily stains, wine, vomit, coffee, rust and blood. The cleaning begins with professional hoovering. Then the cleaner pre-treats all stains and high traffic areas with the right detergents. Your upholstery and sofa will then be cleaned with dry cleaning or steam cleaning method. We can end the cleaning session with applying an upholstery protection spray as well as deodorising. For the leather sofa cleaning as well as the delicate suede sofa cleaning, special stain treatment and cleaning techniques are used. The cleaners will use foam leather detergent and then apply a leather rejuvenator to protect and condition the leather. Excellent Carpet Cleaning was established in 2005 and since then has been delivering the highest quality steam sofa cleaning, dry sofa cleaning and sofa stain removal for the business owners and the homeowners in Enfield EN. Our cleaners are experienced and equipped with modern technologies and solutions provided by the leaders in the cleaning industry. 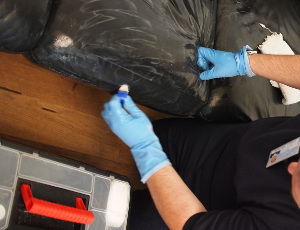 We will clean any sofa for you, no matter if it is a traditional sofa, sofa bed, couch or settee, sectional sofa, convertible sofa, loveseat, sleeper sofa, divan, hide-a-bed or other. Booking requires one easy step - contacting our 24/7 customer care service. Call 020 3404 0500 or use the online booking form to make a sofa cleaning reservation. You pay when the cleaning service has been done, so no deposit is required. Our prices are fixed and include insurance of the sofa cleaning service as well as stain removal. Local landlords, agencies, regular customers and those who book early get a discount.